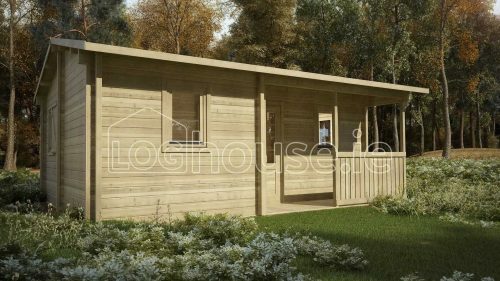 Two bed type D – 2 bedroom log cabin delivered and assembled. 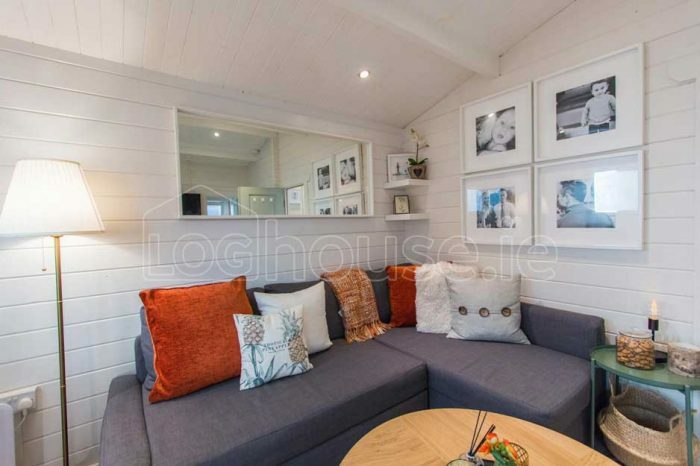 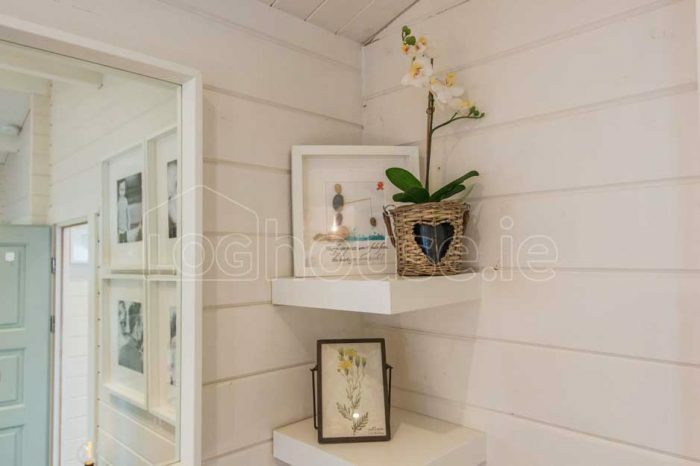 Please see this cabin’s video and photos at our completed projects section: Two Bed Type D – Tudor Lodge, Wicklow. 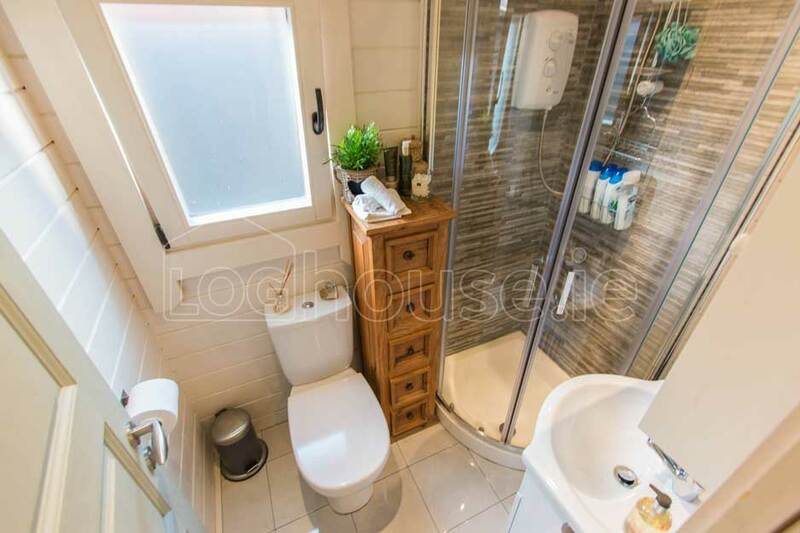 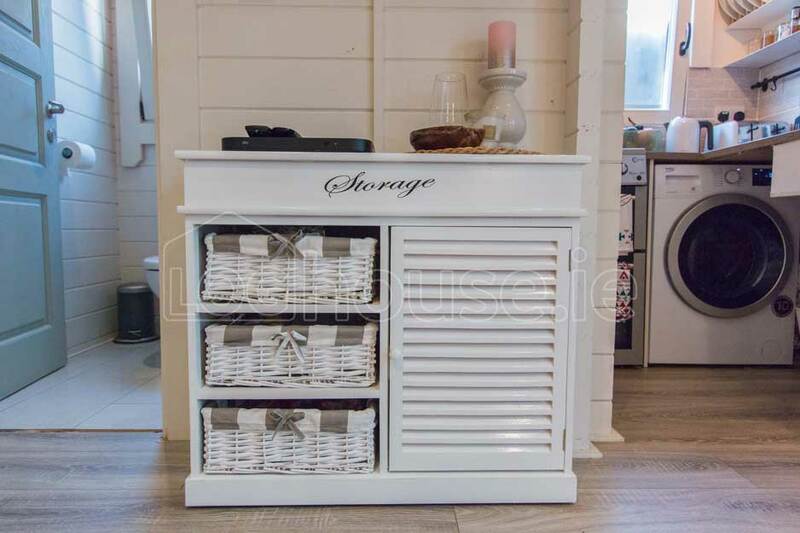 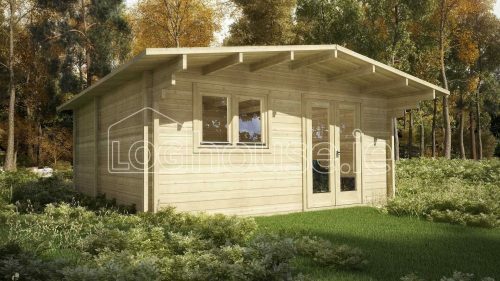 Two bed type D log cabin is budget range two bedroom residential log cabin. 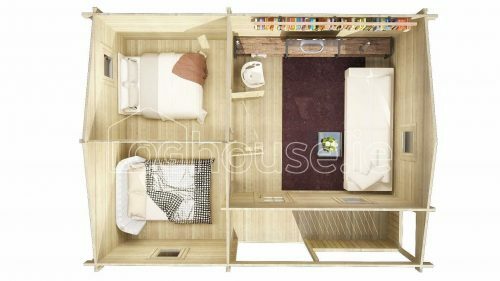 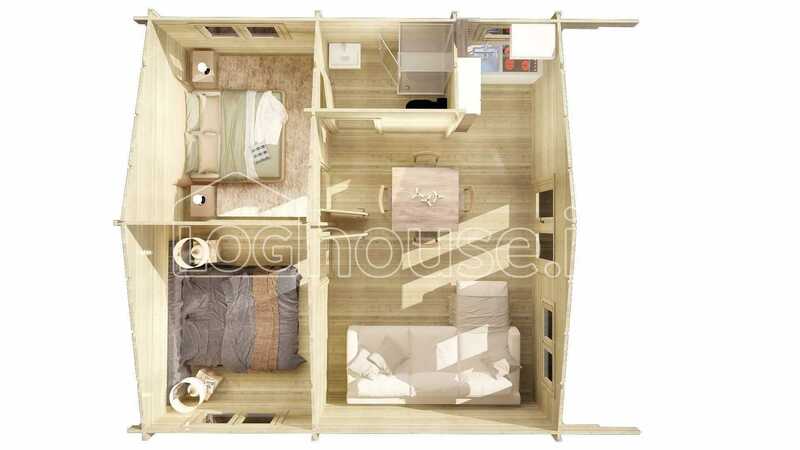 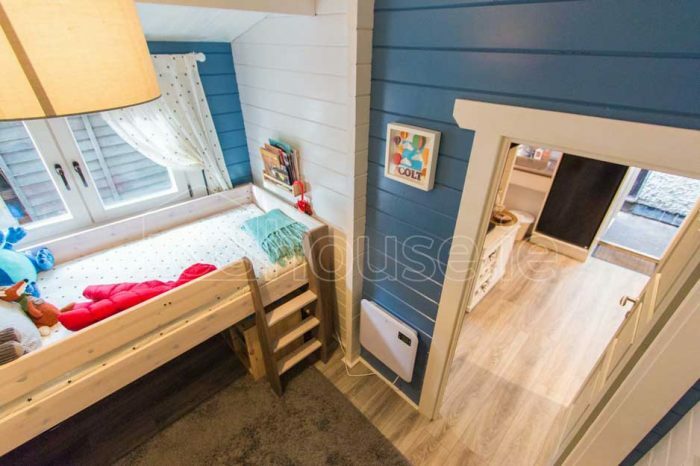 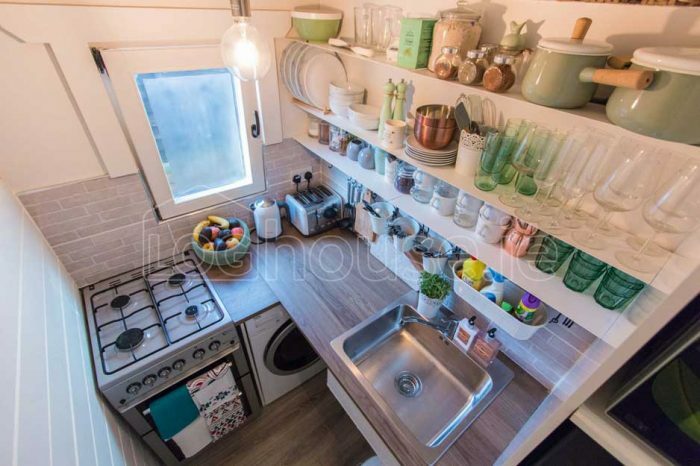 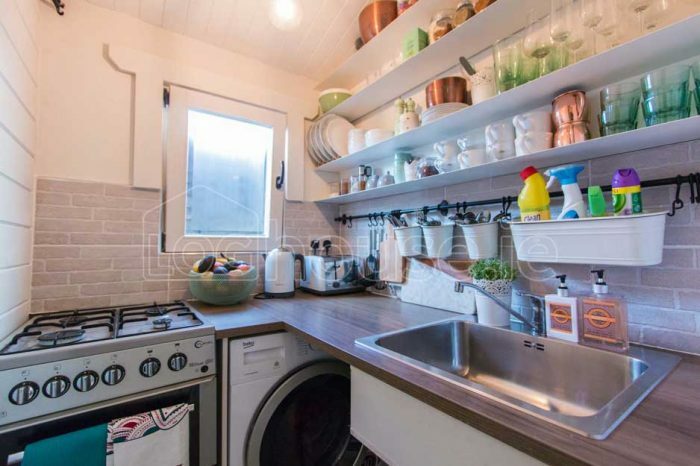 It is smaller than our “Two Bed Type A“ but very similar to our “Two Bed Type B” cabin. 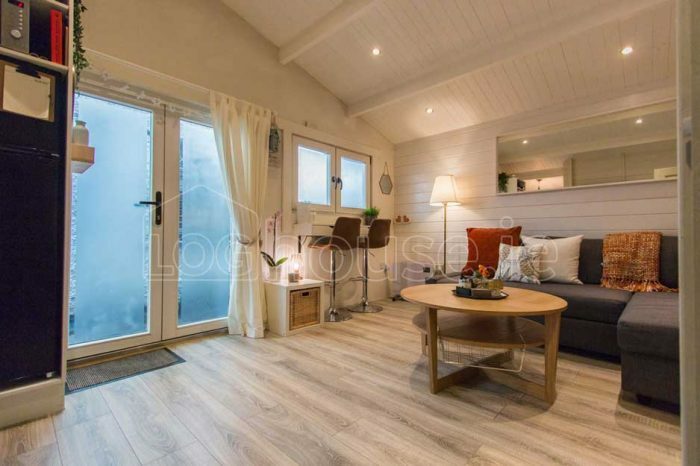 Our clients value this log cabins open plan living room and kitchen area with big bathroom and two bedrooms. 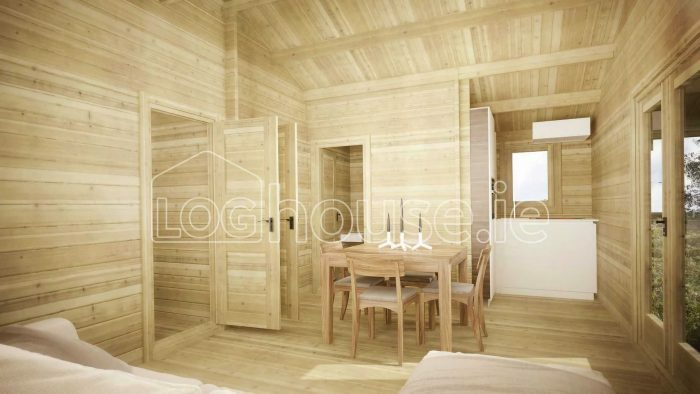 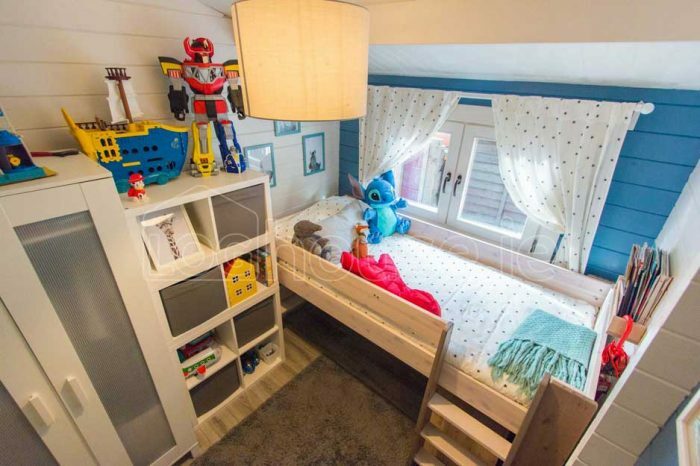 Size is a key in this log cabin design if you are tight on space. 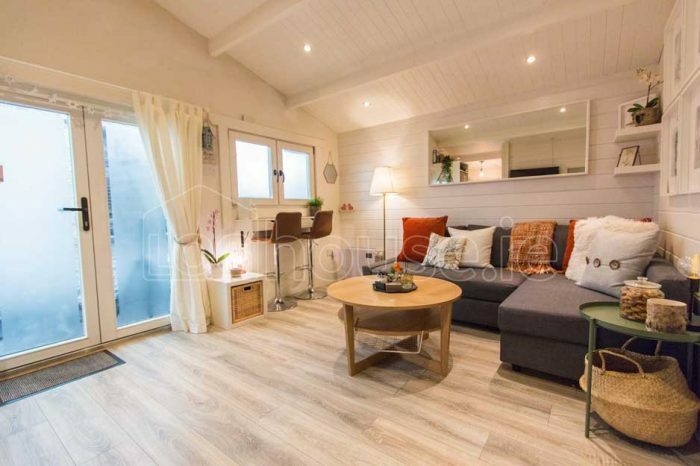 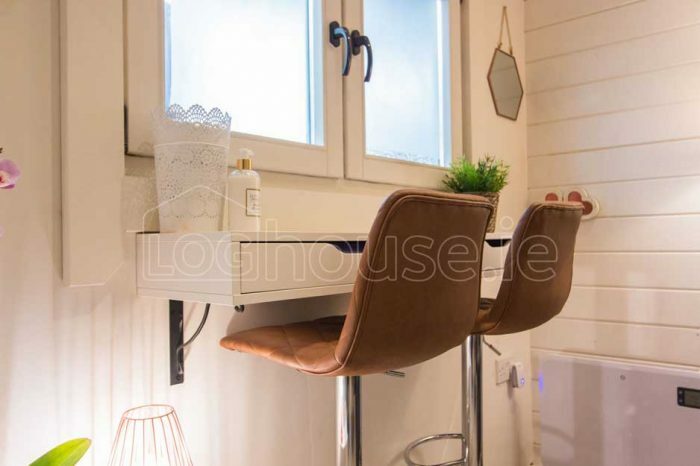 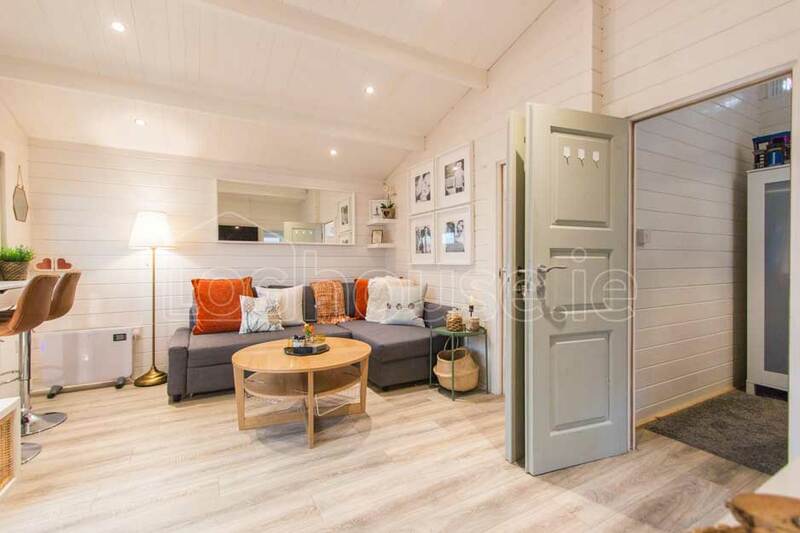 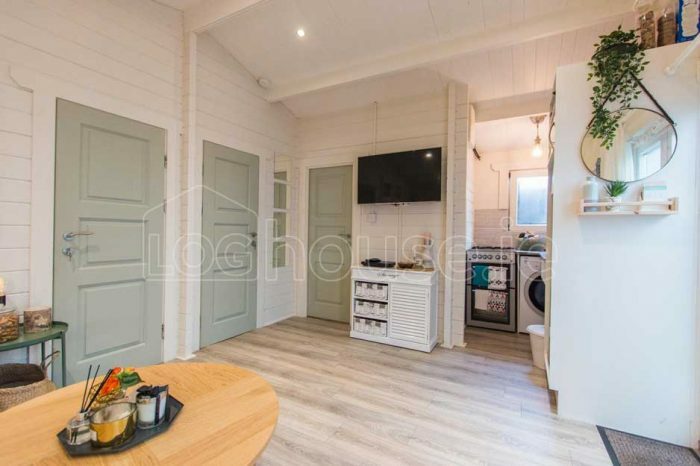 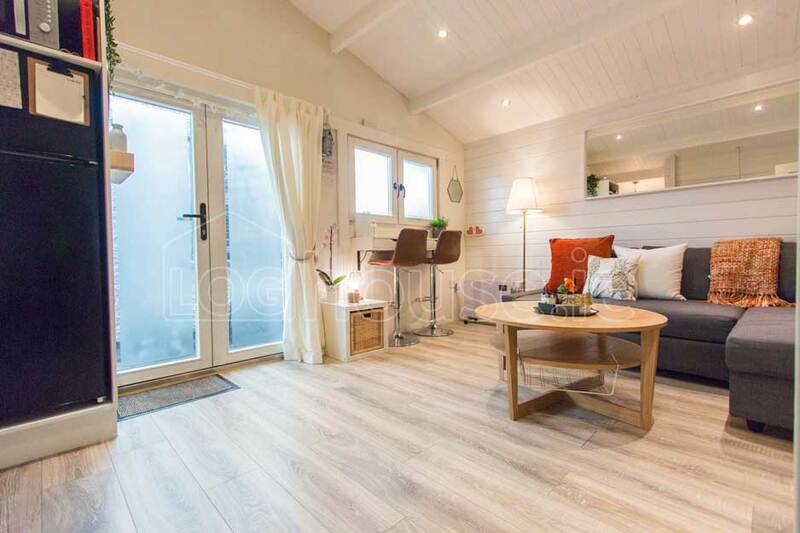 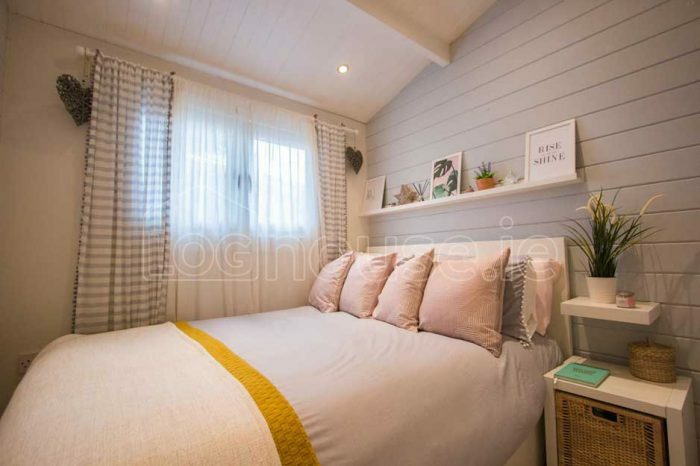 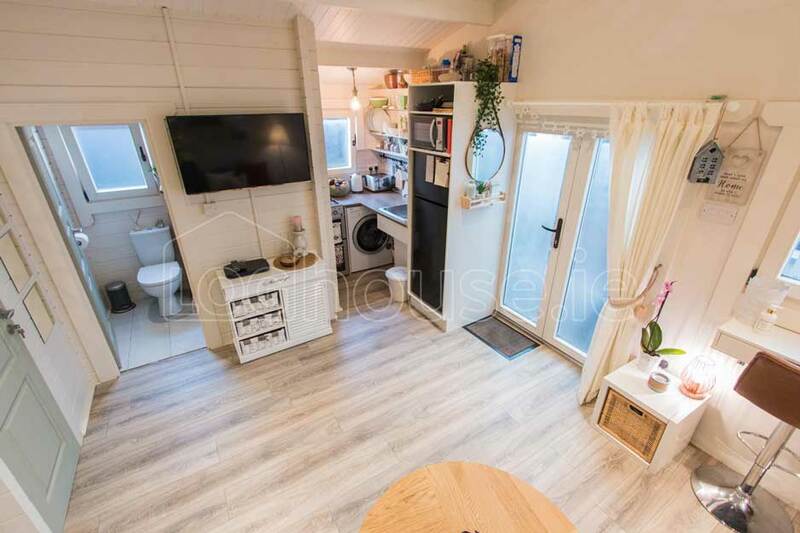 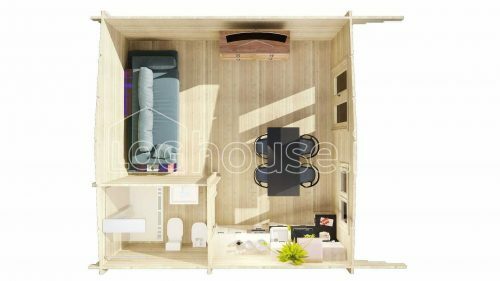 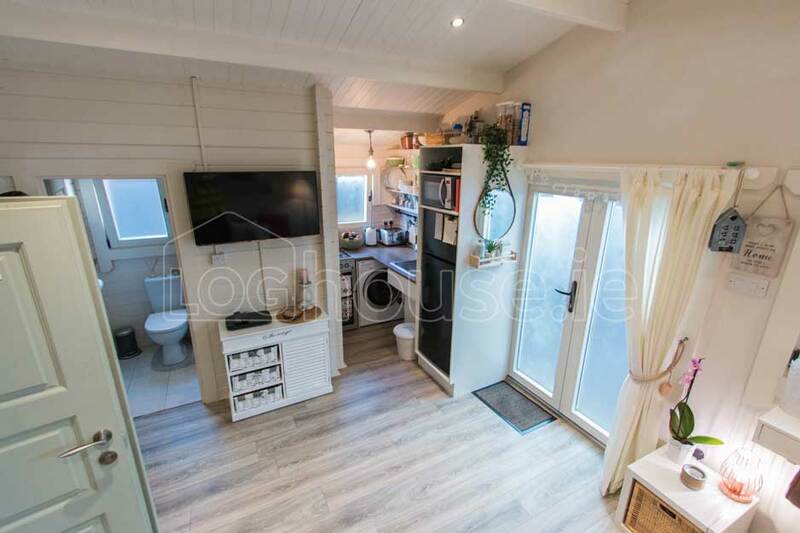 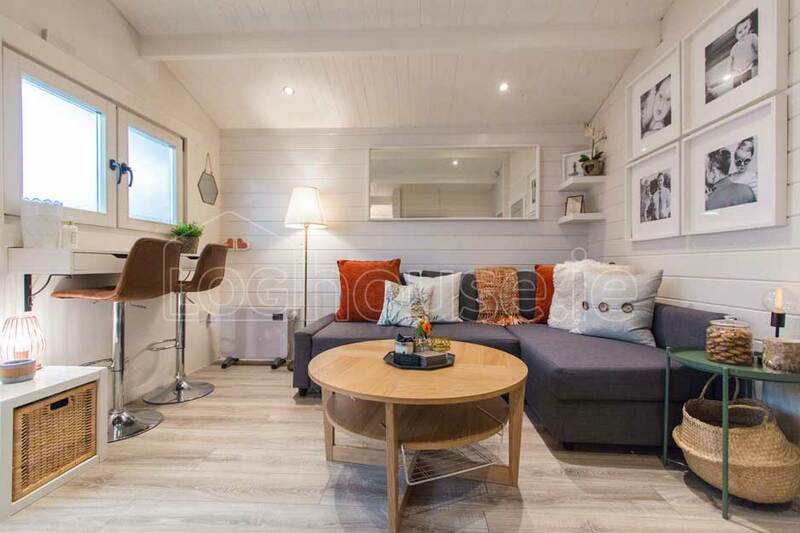 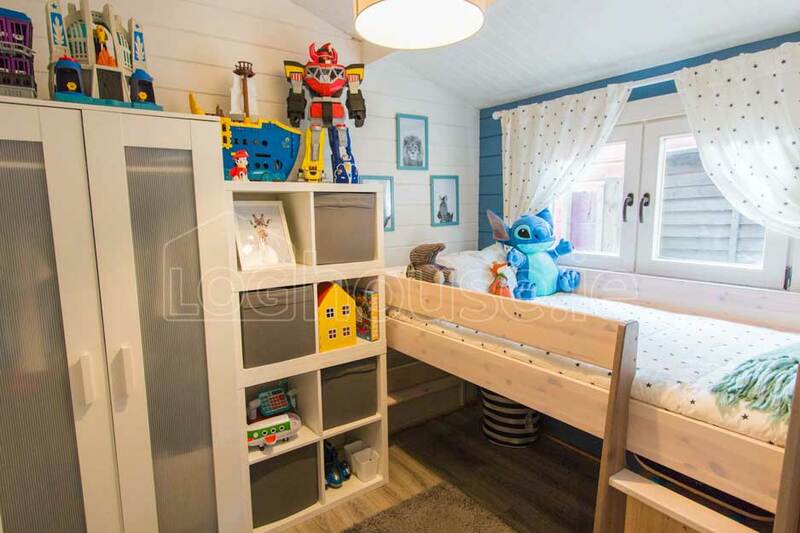 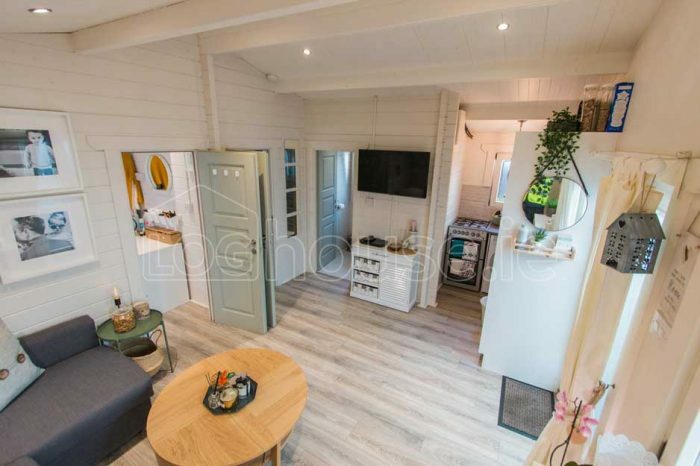 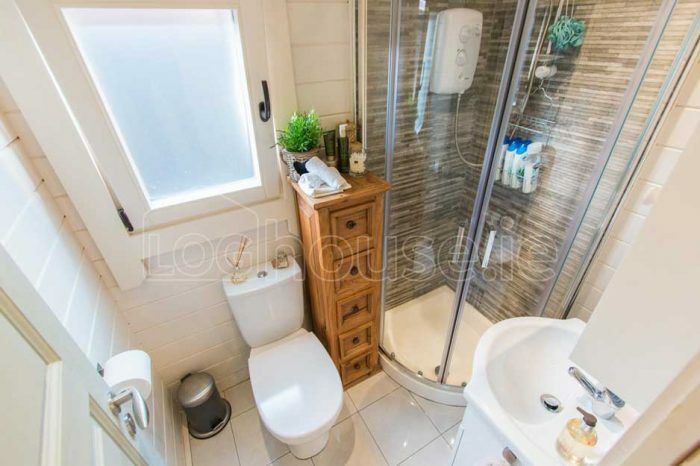 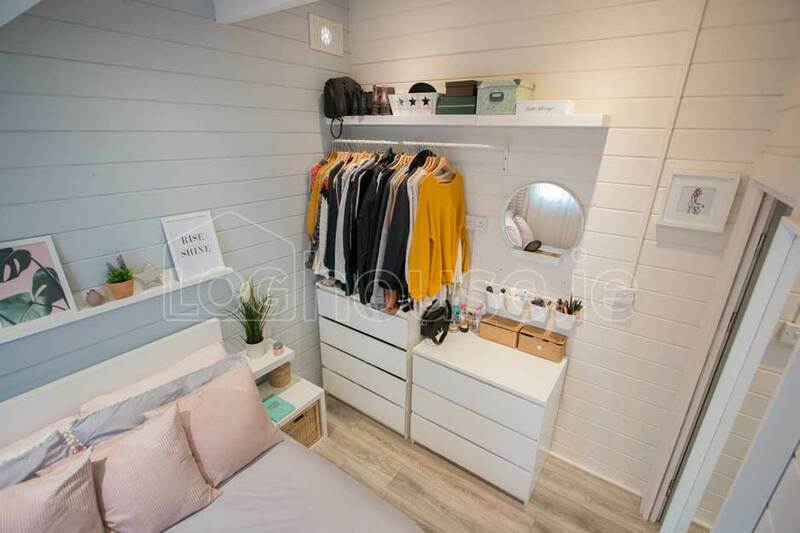 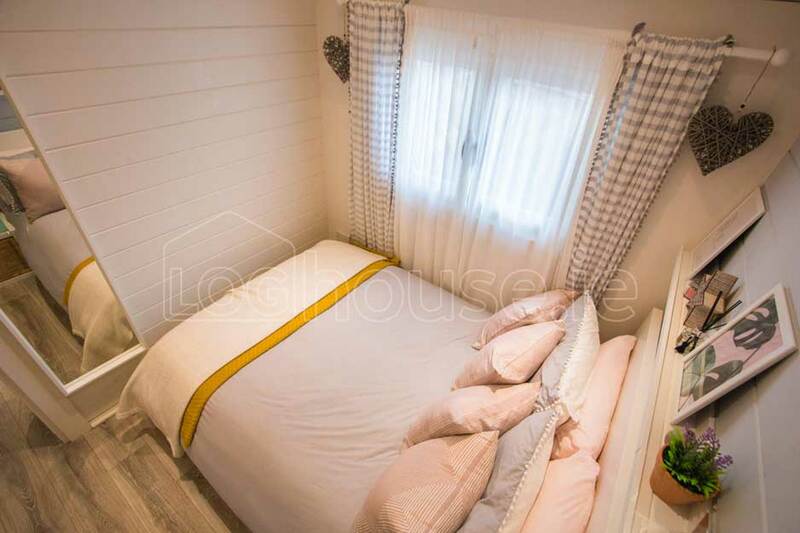 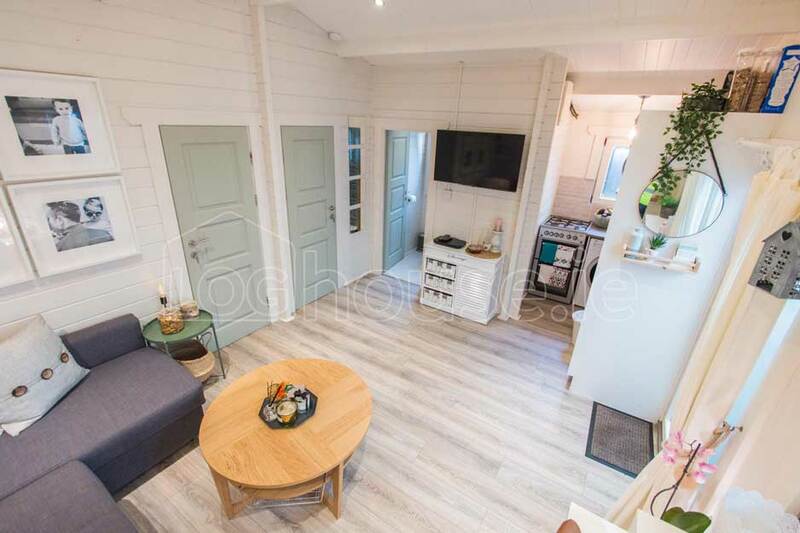 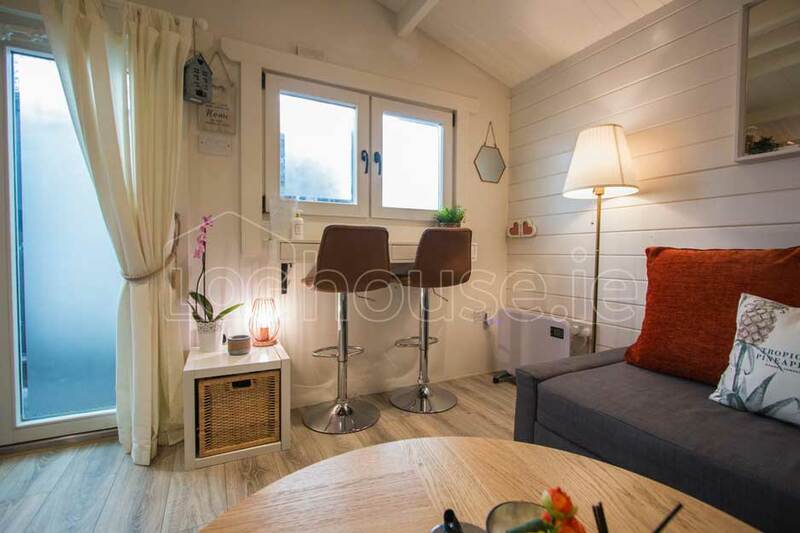 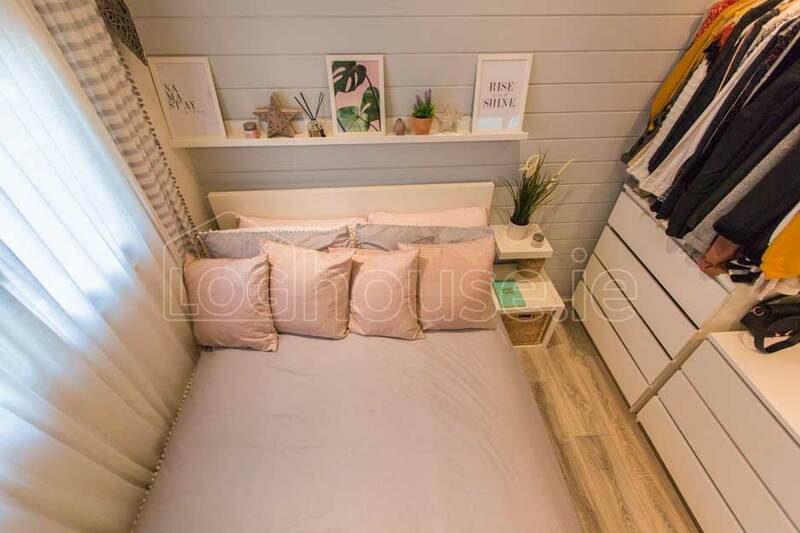 Loghouse has high standards for residential log cabins therefore our two bed type D log cabin comes with insulated floors and 60mm thick logs. 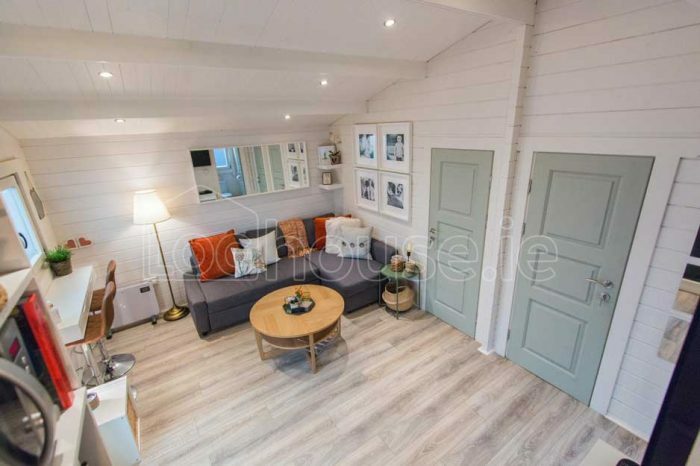 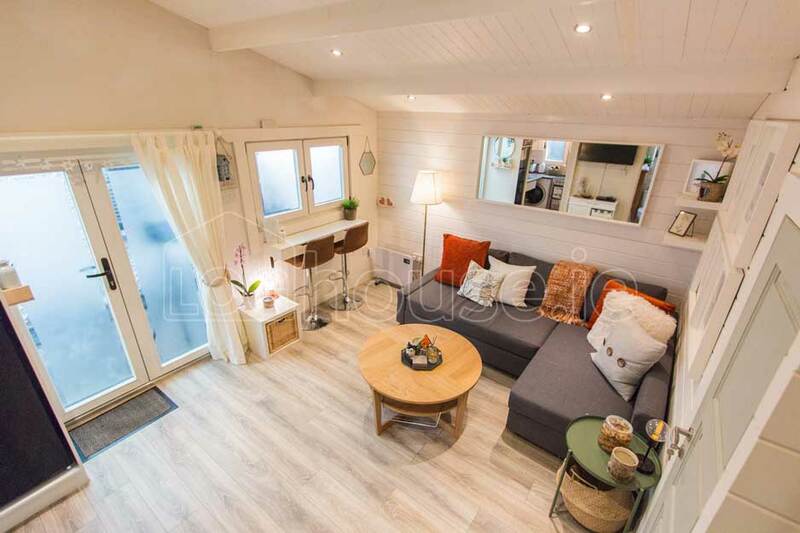 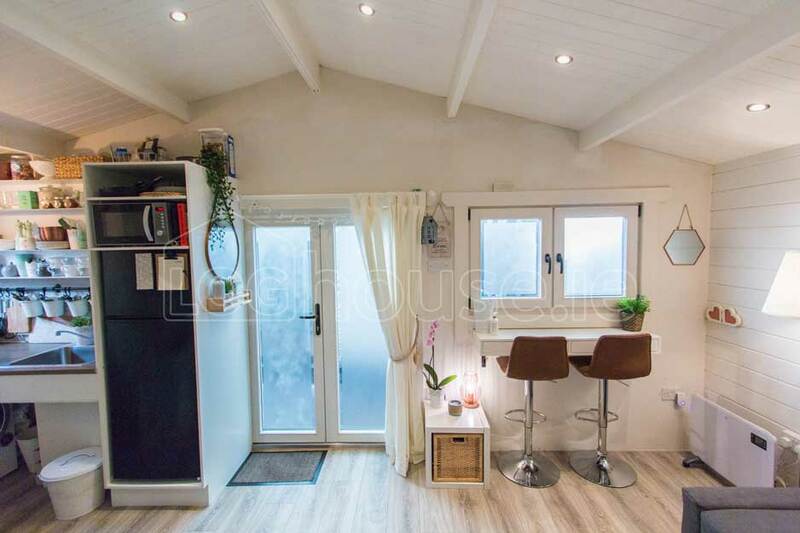 We have recommended options to convert it to all year round living log cabin: insulated roof, living type windows and doors featured with 24mm argon gas filed double glazing and 5 point locking mechanism, steel roof tiles, damp proof membranes on roof and foundation. 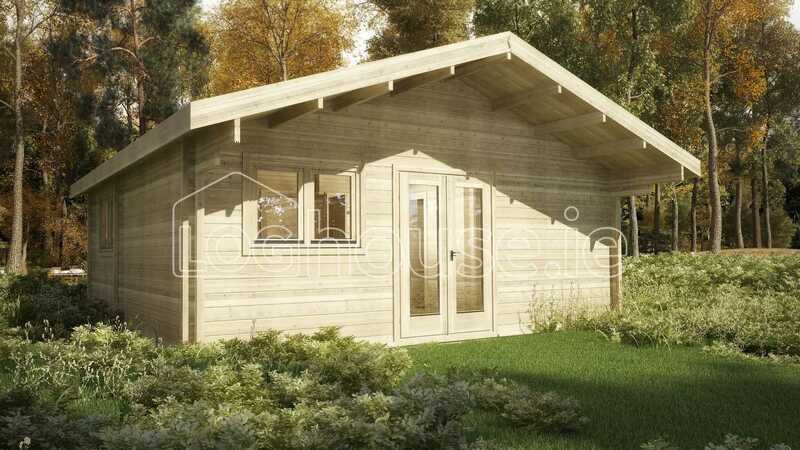 Log cabin can be insulated with 100mm of Knauf Natuboard with 19mm internal timber cladding. This setup makes walls 179mm thickness and very warm in winter and cool in summer. 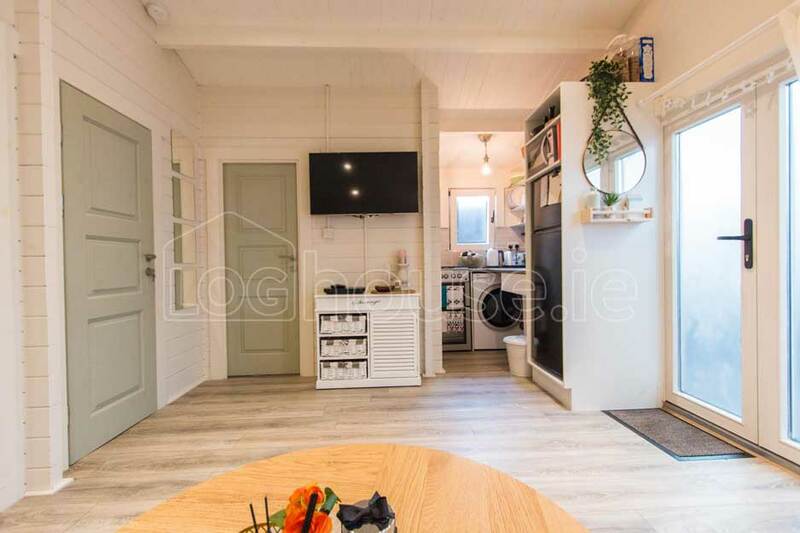 Our walls insulated from the inside, the advantage of such a setup is to hide all electric wiring inside the walls and leave log cabin very clean looking. 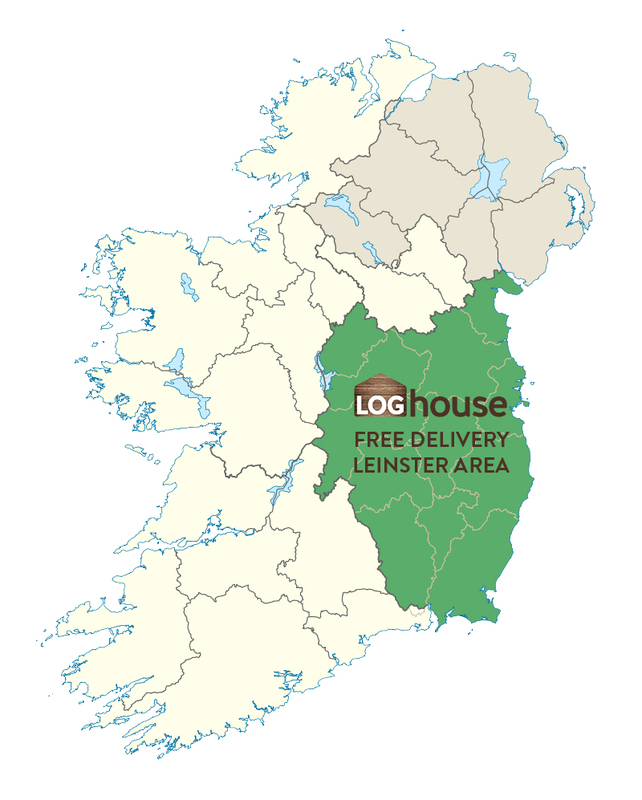 All our electrical work is carried out by in house team. Price guide is €60 per internal electrical point. 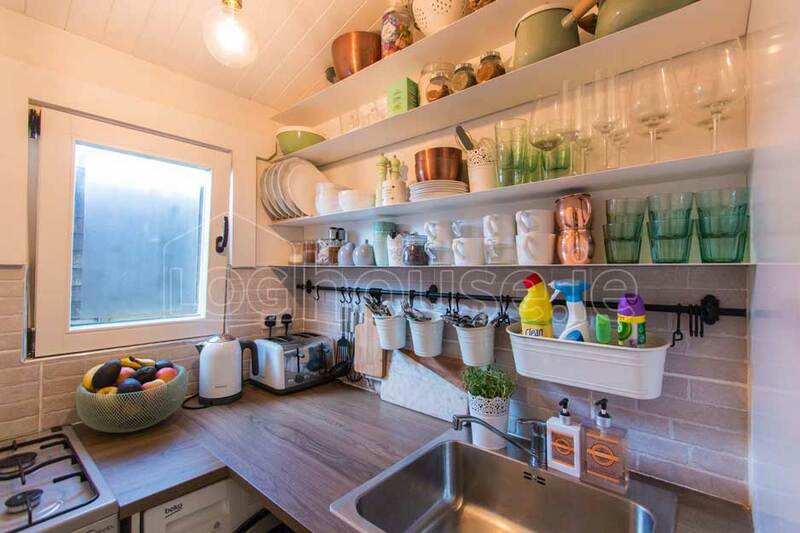 Main connection to the house is priced on site.